Tired of the same old traditional wedding favors? Your wedding should be totally unique and representative of who you are. Give your guests something they will actually use, enjoy, and find themselves talking about the next day. Here is a list of 5 alternative wedding favors that can add some flare to your big day. 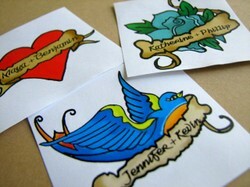 Wedding temporary tattoos add a personal touch to your big day. Each tattoo can be customized with the couple's name in a classic kitchy design, or you can even have a one-of-a-kind design created that is completely personal to you and you partner. Temporary tattoos also create a fun and unique activity for the guests. Set up a 'tattoo parlor' at the reception to give everyone a chance to mingle while they apply their new temporary toy. Nothing signifies a new beginning better than a seedling. Create a small potted plant or flower for each guest to take home. Bamboo, cactus, or your favorite bulb will make a nice display, and it is a gift that is easy to care for. As your love continues to grow, so will each little seedling. Friends and family can re-pot your botanical gift as it grows, reminding them of your wedding day for years to come. Fortune cookies signify good luck and a happy future for the couple and the attendees. Personalized fortune cookies open up a whole world of possibilities. Add a personalized message for each guest, a group of guests, or for everyone! Your message can be thoughtful, funny, or even part of a larger game or theme. Choose an edible cookie or a keepsake made from paper, felt, or even leather. For a retro, hip, 80's style wedding, consider renting a photo booth. Guests can hop in and take photos to commemorate the event. Everyone will line up for the chance to get in on the fun. Plus, each guest will have a totally unique gift from the happy couple. Who doesn't love a photo op?! Add some spice to your reception by offering a customized spice set. You can customize the label with the couple's name, the wedding date, and/or a special message. Spice options can range from sweet to savory, from cinnamon to curry, and from pepper to paprika. Place a few different spices at each table and let the guests decide which ones they will most likely use or venture to try. Mix it up! It's your big day. Get crazy. Most of all, be memorable. Happy weddings! Oh how cool, I love the custom photo booth idea very nice, fun and what a timeless keepsake, there is just something about those photo booths that screams good times!